St. Francis of Assisi devoted himself to solitude, prayer and service to the poor. 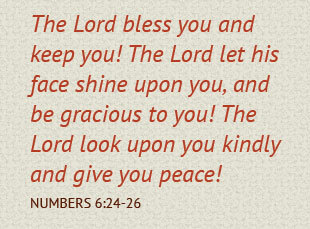 He continues to be the guiding spirit for our ministry endeavors. Our compassionate care for the poor, outcast and oppressed is the Franciscan spirit. We are women who have dedicated our lives to and for the love of Christ Jesus, and to our brothers and sisters in Christ. Public vows made to God, through the church and community, are the manifestation of a life of simplicity and service to the sick and poor. 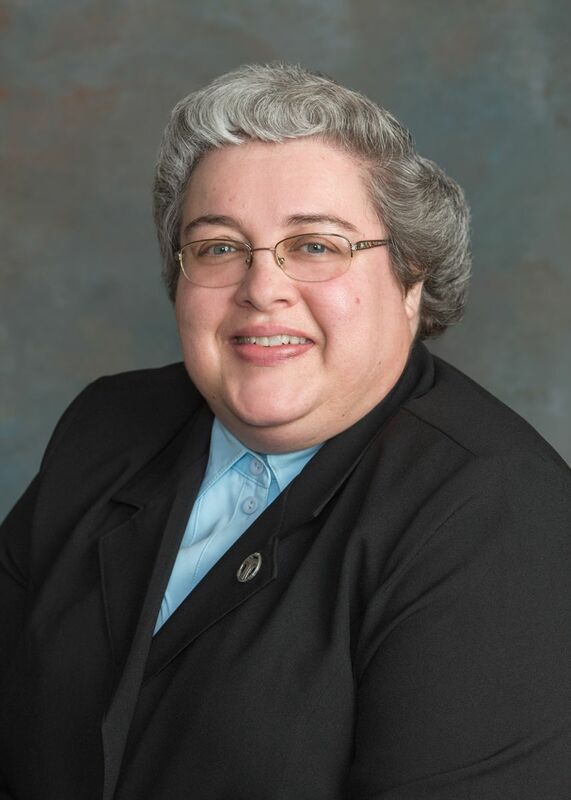 The Provincial Superior and her Council are the governing body of our American Province. Every four years, the Sisters of the American Province have a Chapter of Affairs and Chapter of Election. During this time, the Sisters discuss matters pertaining to our Province and our ministries and also elect the Provincial Superior, Vicaress, and Councilors (permitted by canon law to hold the office for two terms). In civil law, the Provincial Superior would be considered the President. 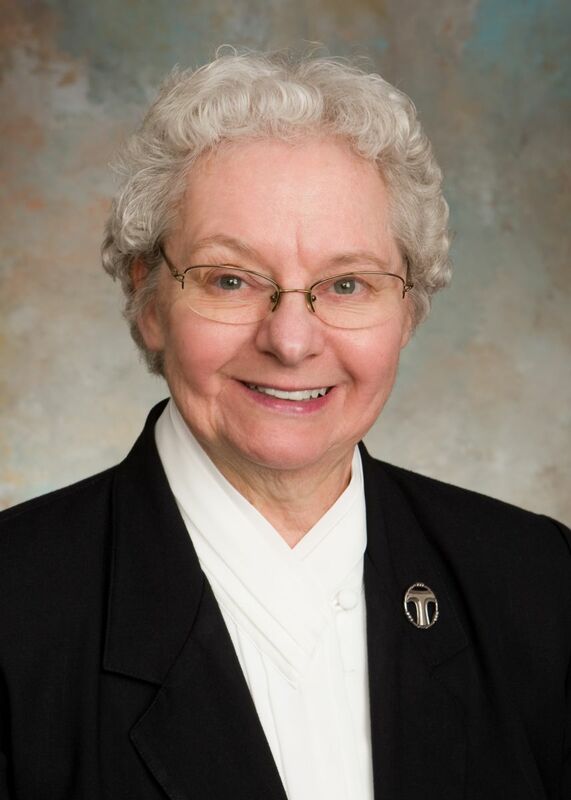 The Provincial Superior represents our Community, its establishments, and the interests of our Sisters. 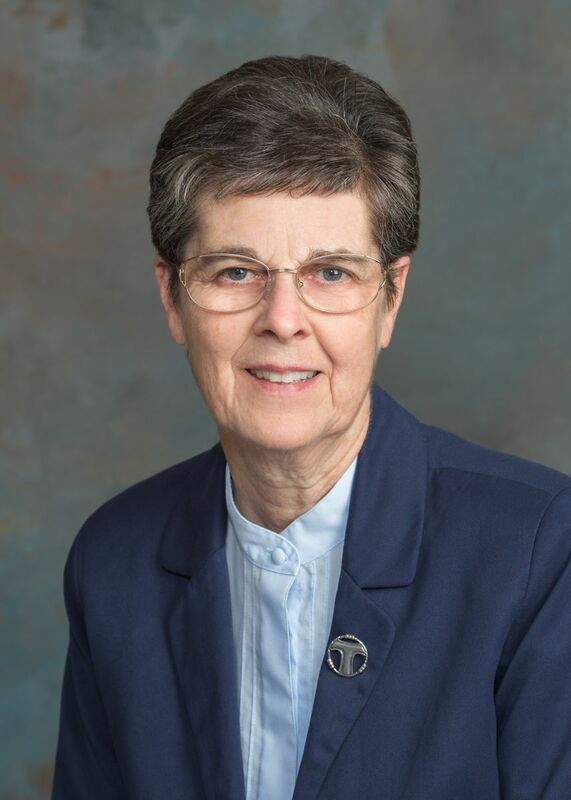 She is responsible for directing our Community in spiritual life and in our ministries. 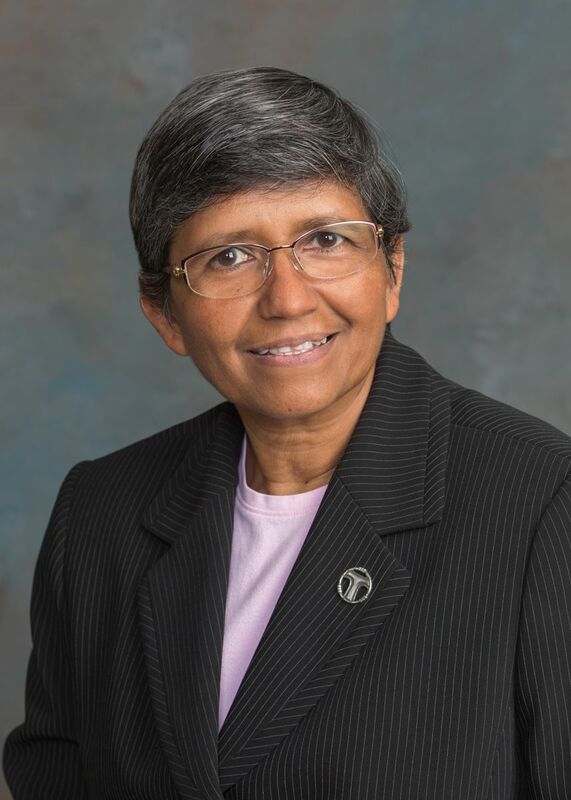 The Provincial Vicaress assists the Provincial in our Province administration and in the absence of the Superior, she assumes her responsibilities. The two Provincial Councilors, together with the Superior and Vicaress, form our Province leadership team that directs our Province business. In addition, the Provincial and her Council serve as Members of Hospital Sisters Health System and Hospital Sisters Mission Outreach. They exercise Reserved Powers to the philosophy and mission along with maintaining stewardship responsibility. We are members of an International Congregation of Franciscan Sisters with Provinces in Germany, Poland, USA, Japan, and India. 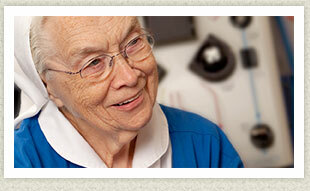 Our American Province is based in Springfield, IL and our Sisters serve in various locations around the world. As Franciscan religious, we strive to live the spirit of St. Francis by living simply, loving honestly and humbly serving one another and all of God's people. This is why many of us entered, and this is why we stay. 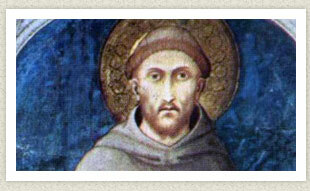 St. Francis was born in Assisi, Italy, in 1182 and died October 3, 1226. In his youth, he participated in activities with his friends that were fun and adventurous. However, reflections during a serious illness helped him to see the emptiness of his life. He gave up every material thing he owned to follow Jesus. St. Francis devoted himself to solitude, prayer and service to the poor. The innumerable anecdotes in the memoirs of his followers show his warm personality and depict his strength of character. His commitment to poverty was the keynote of his spirit and way of life. St. Francis' story is universal and widely known, particularly among many faith traditions and organizations whose focus is related to the environment and social causes. His embrace of the leper was a pivotal turning point in his conversion. Praying before the San Damiano Cross inspired him to live a life of service. He saw everything in nature as equal and held it with great reverence. He wanted to give people something tangible to celebrate Christ's birth in Bethlehem. Because of his deep love for Christ he was blessed to receive the stigmata – the wounds of the crucified Christ – in his hands, feet, and side. His life shows us how to have compassion for the poor, the outcast and the oppressed and inspires a journey toward peace, nonviolence and reconciliation. His message is a guiding light for the present and the future. He teaches us to renew ourselves by striving to live our life as Jesus did. Our International Congregation's symbol blends the Tau with a cord and knots. The three knots are a symbol of our vows of poverty, obedience, and celibate chastity. The cord also symbolizes the world and, thereby, our International Congregation. We are united by the central symbol of the Tau. 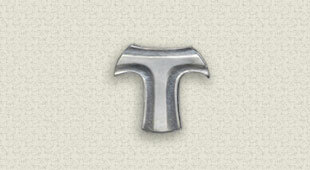 The Tau is a common Franciscan symbol filled with the richness of the past and at the same time, it is a challenge for the future. The Tau is a letter of the Greek alphabet, and in spiritual terms represents the end or the fulfillment of the revealed word. It is a sign of life and salvation. In the Old Testament, the prophet marks those with a Tau who have chosen to reject a sinful lifestyle (Ezekiel 9:4). And in Revelation, those who received the sign of salvation on their foreheads professed themselves belonging to Jesus (Rev. 7:2-3). A sermon by Pope Innocent III in 1215 inspired St. Francis to use the Tau as a sign of his mission to preach penance and as an outward symbol of the religious order he founded. He blessed people with it; he signed his letters with it; marked the walls of his cell. Therefore, it has become the symbol of the Franciscan movement. 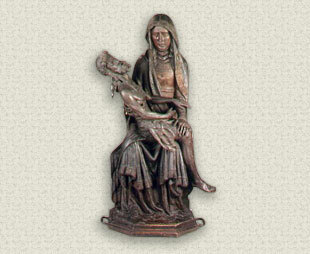 An image of the Pieta of Telgte is imprinted on the reverse side of our symbol. It reminds us of Our Lady of Grace Chapel (Telgte, Germany) where Father Christopher Bernsmeyer, OFM, welcomed young women to begin their life of caring for the sick on July 2, 1844. To learn about the Pieta, please click here. 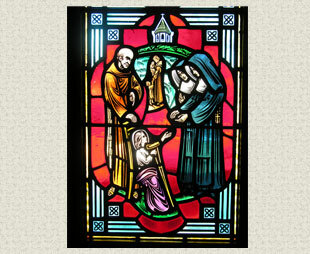 This story provides complete descriptions of the stained glass windows one sees upon entering the main entrance to St. Francis Convent. Click Here to view video. A 12th century Umbrian artist most likely created the Byzantine-style crucifix. St. John's Gospel story of Christ's death is painted on walnut wood using a variety of characters and symbols in icon form. The crucifix is approximately 74" tall, 47" wide and almost 5" thick. 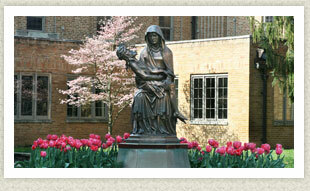 The significance comes from an event that became a turning point in St. Francis' life. During a contemplative walk in the summer of 1206, St. Francis passed by the crumbling San Damiano church near Assisi, Italy when he felt compelled to enter and pray. He knelt before the crucifix and was startled to hear a voice telling him to "go and rebuild my church which as you can see is falling into ruin." He began to gather stones to repair the church. However, he realized that there was a deeper meaning to those words, and it was then that he accepted God's invitation to live a life of poverty and service. The church that God wanted rebuilt was the inner spirit of each person. Some years later St. Clare of Assisi and her religious community (Poor Clares) - followers of St. Francis - were given San Damiano church as their monastery. St. Clare meditated before the San Damiano crucifix for 41 years. When the Sisters moved to Assisi and into their new monastery, they brought it with them. 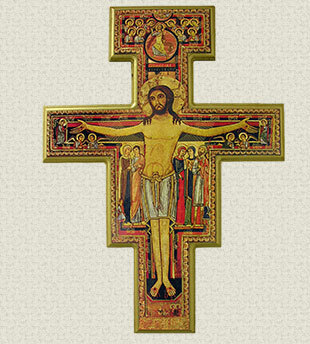 This original San Damiano crucifix continues to be displayed in the Basilica of St. Clare, Assisi.